InnoSense is a uniquely driven engineering company. We are committed to producing technologies for tomorrow, today. Our mission is simple: use our scientific expertise and spirit of innovation to solve problems and improve the way people do things in the U.S., around the world, and in space. Our research staff comprises experts in aerogels, ceramic and glass science, nanotechnology, medical devices and more. Our research and development efforts focus on sensors, materials, coatings, renewable energy and medical diagnostic devices and therapeutic agents. For over 10 years, InnoSense has been developing and commercializing solutions to real world problems. Orlando, FL. - We are proud to announce that InnoSense LLC has received the prestigious R&D 100 Award for FogGo™, our permanent anti-fog coating that leverages nanotechnology to deliver superior anti-fogging performance in harsh environments. The R&D 100 Awards is a coveted technical innovation award that honors R&D pioneers and their revolutionary ideas in science and technology. Past and current recipients of the R&D 100 award include renowned institutions such as MIT Lincoln Laboratory, Los Alamos National Laboratory and Sandia National Labs. In addition to FogGo, Innosense also received special recognition for Therm-E-Log™, a battery-free time-temperature dosimeter that can monitor the thermal history across a variety of applications. Therm-E-Log was recognized as one of the top finalists for its category. Accepting the awards on behalf of Innosense was Uma Sampathkumaran, SVP of R&D, and Shanto Goswami, VP of Business Development. Dr. Sampathkumaran leads the team that developed and commercialized the FogGo technology as well as Therm-E-Log. The R&D 100 Awards have served as the most prestigious innovation awards program for the past 55 years, honoring great R&D pioneers and their revolutionary ideas in science and technology. For this year's R&D 100 Awards, not one, but two of InnoSense's technologies have been selected as finalist for the award: Therm&dash;E&dash;Log™ and FogGo™. The 2018 R&D 100 Winners will be selected and announced on November 16, 2018 at the Waldorf Astoria Orlando in Orlando, Florida. Both Therm-E-Log and FogGo were selected by a panel of expert independent judges as finalist for the prestigious award based upon their merits and ongoing contributions. Dr. Uma Sampathkumaran, Senior Vice President, and Mr. Shanto Goswami, Vice President, Business Development, will attend the R&D100 Awards Dinner to represent ISL. Dr. Sampathkumaran and Mr. Goswami will also attend the R&D100 Conference from November 15&dash;16, 2018 (also hosted at the Waldorf Astoria Orlando). Be sure to join us at the NASS conference, where Innosense LLC (ISL) Senior Scientist and Principal Investigator, Dr. Anamika Ray, will be discussing the future of ISL’s saliva-based diagnostic biosensors along with research for her successful Phase II entitled "NanoWire Array Diagnostics for Early Multi-organ Injury in Saliva". Dr. Ray will be holding a Q&A session after her presentation as well. The NASS Conference, which takes place from September 15-16 at the Collaborative Life Science Building & Skourtes Tower in Portland, is an opportunity for salivary researchers and industry players to connect with fellow researchers and learn about the latest trends in Dentistry, Medicine, Pediatrics, and related disciplines. For more information on NASS, please visit the symposium's website. For more information about Dr. Ray's presentation or about ISL's other biosensor programs, please visit our webpage on our diagnostic biosensors or contact us at [email protected]. The U.S. Missile Defense Agency (MDA) has awarded InnoSense a Phase II contract to continue the development of a ceramic roll-able separator for lithium oxyhalide batteries (LOHB) under the project titled "Lithium Oxyhalide Battery Separator Material". The ceramic membrane separator will be flexible enough to integrate into the geometries of LOHBs and, maintain mechanical flexibility and handling in a typical production environment. The flexible ceramic separator will offer corrosion resistance, high thermal stability, optimal electrical insulation, ion permeability and ruggedness towards the goal of improving the robustness, safety, cost and lifetime of LOHBs. If you are interested in learning more about this technology, please contact us at [email protected]. The National Aeronautic and Space Administration (NASA) has awarded InnoSense (ISL) a Phase II contract to continue ISL's research on developing a Polymer Nanowire-Based Reversible and Quasi Real-Time Ethylene Analyzer. The goal of the project is to develop an ethylene monitor capable of in situ, real time monitoring with minimal interference from metabolites like ethanol and acetaldehyde. The ethylene monitor will be able to selectively detect ethylene at ppb levels - a critical requirement for its intended NASA use in enclosed areas of plant growth in space. This Phase II contract builds upon the successful feasibility demonstration from Phase I. If you are interested in learning more about our nanowire-based environmental sensors and their multiple applications, please visit our webpage or contact us at [email protected]. The National Aeronautic and Space Administration (NASA) has awarded InnoSense a Phase II contract for the work titled "Modified Ionic Liquid-based Phase Change Materials as Effective Heat Exchangers." This project is a continuation of a Phase I contract During Phase I, ISL successfully demonstrated the feasibility of these ionic liquid-based phase change materials as heat exchangers for new thermal management systems to regulated heat transfer among components within space vehicles or small spacecrafts across NASA enterprises. If you are interested in learning more about our phase change materials and their applications, please visit our webpage or contact us at [email protected]. Uma Sampathkumaran (Vice President of R&D) is currently at the National Armaments Consortium (NAC) General Membership Meeting at the Hilton Parsippany, NJ. She will be at there until March 23, 2017. Dr. Sampathkumaran will present ISL's current relavent efforts and accomplishments: Therm-E-Log, HyperGoLeak and FogGo. NAC General Membership Meeting attendees interested in any of our technologies can reach out to Dr. Sampathkumaran by contacting us at [email protected]. InnoSense's Deputy Director, Dr. Maksudul Alam, and Research Engineer, Anthonie Johnston, are attending the 5th Annual UCLA Medical Device Partnering Conference in UCLA's California NanoSystems Institute. The two ISL representatives will be networking and discussing ISL's point of care diagnostic devices including Adnos, a biosensor for the early detection of Alzheimer's Disease, and Nano-Mos, a saliva-based biosensor for multi-organ injury detection. If you are interested in any of these technologies, please visit the our webpage on our diagnostic biosensors or contact us at [email protected]. InnoSense LLC (ISL) has developed CryoPore™ for NASA space exploration applications. CryoPore is a polymer-reinforced, non-brittle, lightweight cryogenic insulation designed for reduced lifecycle costs. This technology has been featured in NASA Tech Briefs (February 2017 issue). CryoPore is part of ISL's emerging line of composite foams for effective insulation &dash; polymeric composite foams offering superior thermal insulation and customizable features including radiation shielding. CryoPore engineering was funded through the NASA SBIR program at the Kennedy Space Center. For additional information on CryoPore or other composite foams, please contact us at [email protected]. Uma Sampathkumaran (Vice President of R&D) will attend the 2017 National Armaments Consortium (NAC) General Membership Meeting to be held on March 21-23, 2017 at the Hilton Parsippany, NJ. The NAC General Membership Meeting is a unique opportunity to discuss the requirements, challenges, and emerging opportunities. As a current DOD contractor, ISL will present its current relevant efforts and accomplishments including: Therm-E-Log, a time-temperature dosimeter to monitor the thermal history of ordnance; HyperGoLeak, a hypergolic propellant leak detector; FogGo, durable and abrasion-reistant anti-fog coatings being developed for the Joint Service Aircrew Mask-Fixed Wing Variant (JSAM-FW) lenses. Uma Sampathkumaran (Vice President of R&D), Anamika Ray (Senior Scientist) and Lexi Donne (Technology Transition Consultant) attended the 24th International Molecular Med Tri-Con held in Moscone North Convention Center, San Francisco, CA. ISL representatives took this opportunity to network with organizations in the medical diagnostics market, including current collaborator, Dr. Paul Slowey of Oasis Diagnostics. 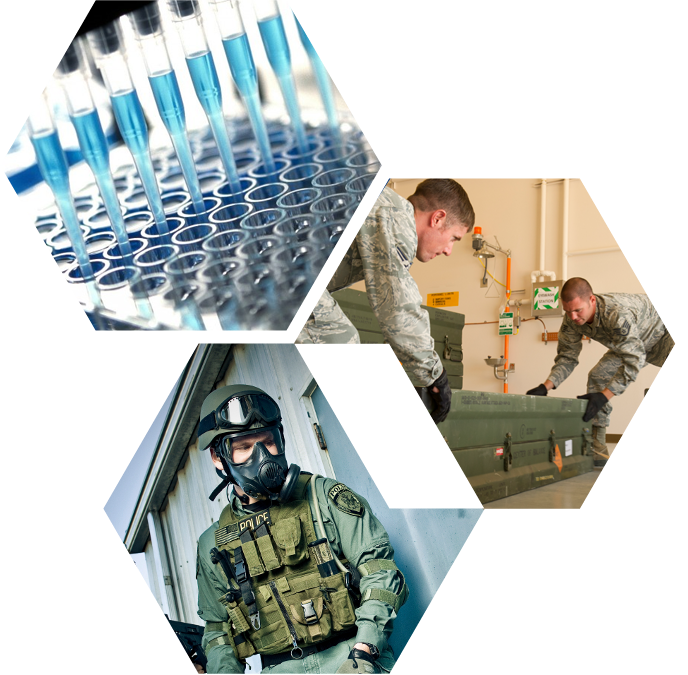 ISL and Oasis Diagnostics are actively working on the development of a saliva-based Point of Care diagnostic for the detection of multi-organ injuries funded by the Defense Health Agency. Additionally, ISL is actively pursuing development of Point of Care diagnostics for Alzheimer's, mercury poisoning, and Dengue and Chikungunya viruses using our proprietary nanowire platform. To find out more about our diagnostic sensors visit webpage here or please contact us. The National Institutes of Health has awarded InnoSense a Phase II grant for the work titled "Nanowire Sensor Array-based Assay for Early Diagnosis of Alzheimer's Disease." This project is a continuation of the Phase I grant. During Phase I, ISL successfully demonstrated that the biosensor is capable of detecting 100 femtomolar level Alzheimer's Disease specific biomarkers. In Phase II, ISL will further optimize and evaluate the biosensor's performance. Uma Sampathkumaran, Vice President of R&D and May Maung, Research Engineer, will represent InnoSense LLC (ISL) at the 2016 AUSA Annual Meeting and Exposition (booth# 225). The AUSA Annual Meeting will be from October 3-5 2016 at Washington D.C. The AUSA is one of the largest land warfare expositions and professional development forums in the world and presents a unique opportunity to learn about ISL's technology from the R&D staff. The ISL exhibition will feature the following technologies: Therm-E-Log, FogGo, Trap&See and HypergoLeak. Stop by the exhibition (booth #225) to see samples, experience the technology firsthand and learn more. ICM's The Climber, a remote-controlled robot that can scale virtually any vertical or inverted surface, spray coated ISL's Trap & See-Hg on dry wall, cement and aluminum surfaces. Videos and photos of the Climber's spray coating and peeling Trap & See-Hg coatings can be viewed in detail under Trap & See's description. To find out more about Trap & See and the technology behind it, visit our Trap & See description section or contact us. FirePhob Discussed in "The Heat is On"
In "The Heat is On" Corrie Pelc reviews the future of flame-retardant textile protection including InnoSense's FirePhob - a family of nontoxic, non-halogenated, flame retardant materials. The article review was published in the American Association of Textile Chemists and Colorist for the November/December 2015, Vol. 15, No. 6 issue. Pelc's thesis is that fire retardants are one of the textile treatments which have a significant impact - protecting and saving lives. ISL's FirePhob flame retardant materials are featured here as an example of a novel effective, breathable, nontoxic FR treatment, but also of one which has the potential to reach a wider end user market. As FR treatments, such as FirePhob, become safer, cost-effective and long lasting, FR treated textiles could become a standard feature in more textiles. To find out more about FirePhob and the technology behind it, visit our FirePhob description section or contact us. The United States Patent and Trademark Office (USPTO) has issued a patent for Therm-E-Log on March 17 (United States Patent no. 8,979,361) to ISL. 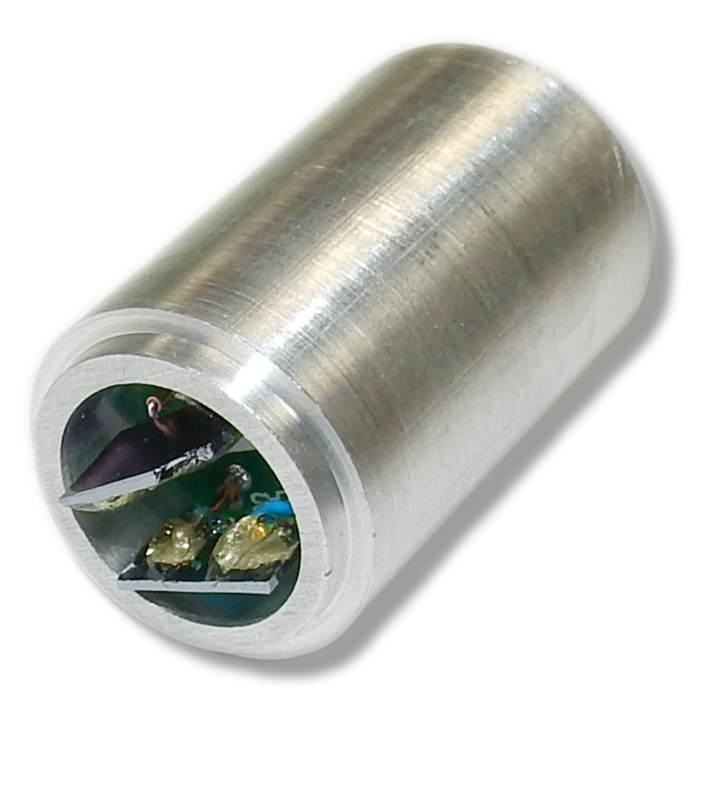 Therm-E-Log is a customizable time-temperature dosimeter, full claims and description can be found at the USPTO's full-text and image patent webpage. Therm-E-Log was developed using government support under contract number W15QKN-09-C-0153, awarded by the U.S. Army Joint Munitions &AMP; Lethality (JML) Contracting Center. Therm-E-Log has been under development for use by the Army to monitor the temperature exposure of ammunition thus, also ensuring ammunition quality and personnel safety. Prospects for the wider use of Therm-E-Log by DoD agencies is high for in addition to the issued patent, Therm-E-Log field trials are also underway. 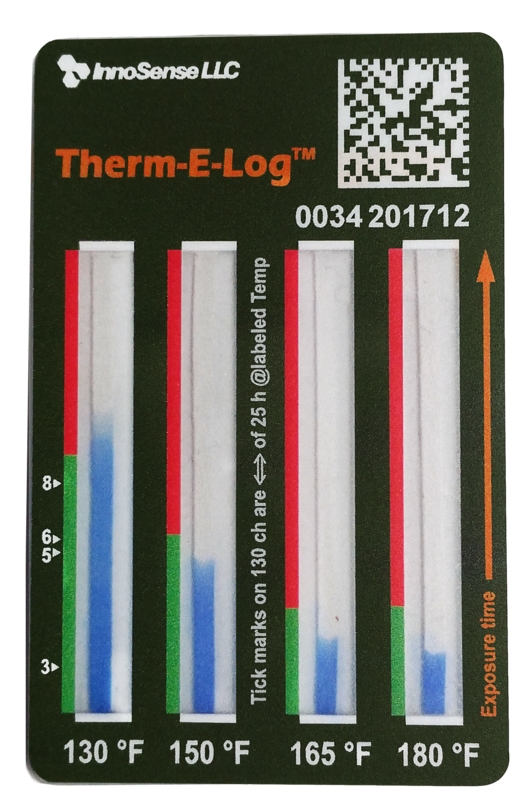 To find out more about Therm-E-Log and the technology behind it, visit our Therm-E-Log description webpage. The Department of Energy has awarded ISL a Phase II contract for the work titled "Thermo-Mechanically Stable Tungsten Powders as Solid Catchers for the Fast Release of Stopped Rare Isotopes." This project is a continuation of the Phase I contract of the same name. Interested in InnoSense and want to get in touch?